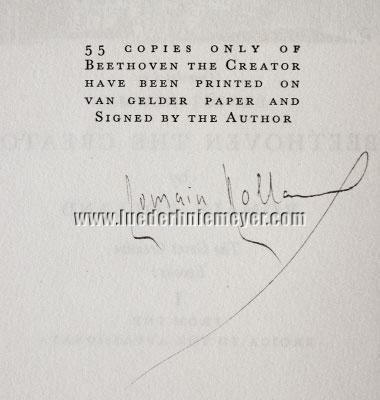 Beethoven – Rolland, Romain. Beethoven the Creator. The Great Creative Epochs. I: From the Eroica to the Appassionata. From the French by Ernest Newman. 2 vols. London, Victor Gollancz, 1929. Large 8vo (10⅜ × 7⅛ in [26.5 × 18 cm]). With woodcut illustrations and 30 plates. 432 pp. Orig. cloth in time-marked slipcase with édition de luxe title label. First English edition, one year after the French original, of the 2-vol. 1st part (supposedly all) of Rolland’s Les grandes époques créatives, whose likewise 2-vol. 2nd part Le chant de la résurrection. La Messe solennelle et les dernièrs sonates followed only in 1937 and has found obviously no continuation within the English edition here. In the BMC (now British Library Catalogue) only present 1st part and only as one of 55 copies, too. – With 168 pages Appendix ! Spines of especially vol. II speckled with light brown (little) spots as to be found as isolated little spot also in the margins of the two final sheets of vol. I and, slightly larger, on its white endpaper and with some quite isolated further ones on a few previous pages, otherwise wonderfully fresh. autographed by the author . 4 vols. Paris, Ollendorff, (1921). 8⅜ × 6¼ in (21.2 × 15.8 cm). on three covert bands with orig. wrappers incl. back bound with, the front of which in reddish brown & black and eight varying, unique hand-made endpapers in iridescent cloud marble. Gilt head edge. 2 edges uncut.